Space Invader invaders The Outsiders gallery, London. 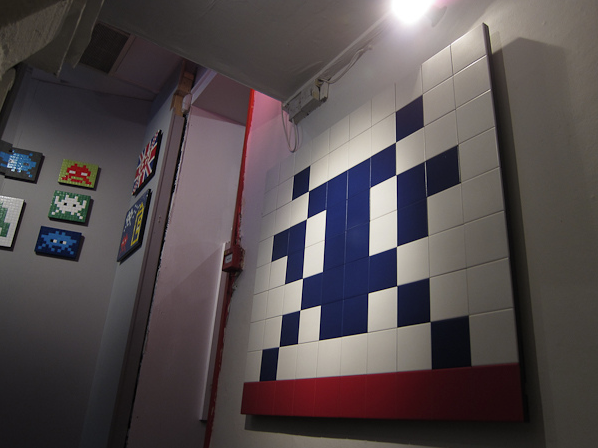 Space Invader currently has a show at The Outsiders, in Soho. 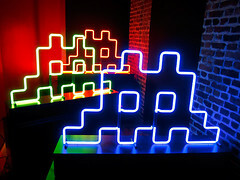 It’s not quite as epic as his 1000th Parisian Invader show earlier this year – but you can get Invader waffles.. Mmmm. There’s also a cool video of the artist at work in the basement along with an invaded disco ball. Or you can drop a cool £5000+ to buy an official alias on one of his many works. Hint: It’s getting close to Christmas and the show’s on till Christmas Eve… Click here for a few pics. Having had such an amazing time at the ENO/Punchdrunk production of The Duchess of Malfi last week we decided to go and do it all again… Was it any different the second time around? Yes, but it lost something in the repetition, the innocence and excitement of the unknown. That said, it was great to follow the Duchess (the excellent Claudia Huckle) around to try and follow her story. The highlight for me this time was being one of the first people into the building and the intense sense of dread walking around an almost pitch black set, with rate fellow spectators as they emerged from the gloom. In one room where the dry ice machine was on overdrive I had to just stop walking for a bit, it was so unnerving. There was a room on the ground floor I didn’t even enter it was so dark. Eventually other audience members joined me, and at this point the wonder of seeing the bit players come out to lead us all towards the main action took over. Slow dances broke out across the set and eventually the principle singers emerged and the story started. You really started to appreciate the artistry of the stage management, with the lights in areas dimming and intensifying to help draw you towards particular areas, or move you away so for diversionary tactics. Following the Duchess did lead to some overlap in what I’d already seen, however there were still so many new experiences along the way to be head. Being in the pitch dark as lightning flashes illuminated the Duchess and her brother, a bizarre birth scene with digital baby. Seeing the Cardinal ‘abduct’ a female audience member and give her a solo performance in his room was at once chilling and elicited some jealousy. Being almost knocked over by the Cardinal’s assistant as he ran through the set caused me to swear out loud. During the finale one of the mourners draped themselves against me for a while which was unnerving. 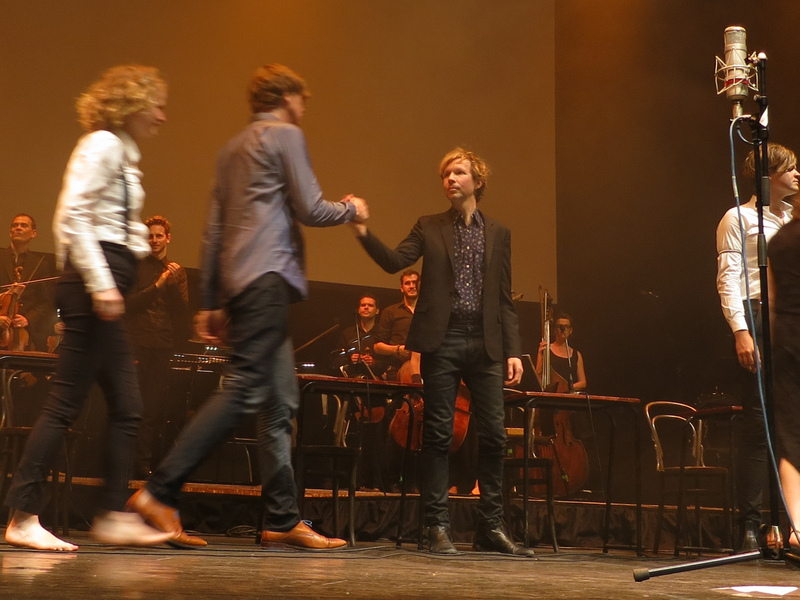 There was still more I missed, the secret schoolroom inside a cupboard, and the cardinal’s story, but again it was a superb experience being so close and intimate with talented performers, and one we were glad to repeat. Roll on the next show. Oh, and as an aside this is apparently my 1000th post on this blog.. Cake anyone? 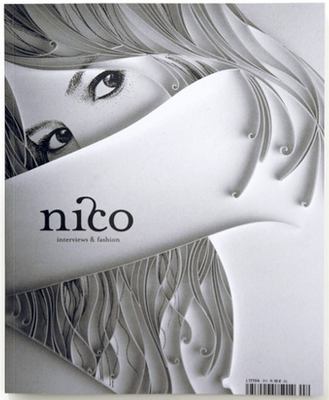 I picked up a copy of nico magazine due to the wonderful paper filigree cover by young artist Yulia Brodskaya – and I recommend you do the same. It’s well designed in a mix of English and French, with stunning photography and other art works, but still maintaining a light touch. 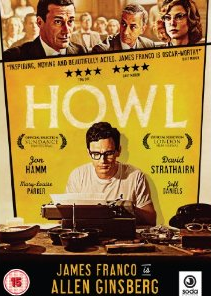 Go check it out – or just be inspired to try out cutting small bits of paper and sticking them down yourselves. As the last few hours of 2009 draw to a close we can reflect on the year that’s been. Or we can do the same as every newspaper across the world has done and reflect on the decade that’s been – the ‘noughties’. 2009 for me has been dominated by an increasingly joyous obsession with Space Invader graffiti, combined with my first full year of work in London since ’97 and the opportunity to do some European travel. 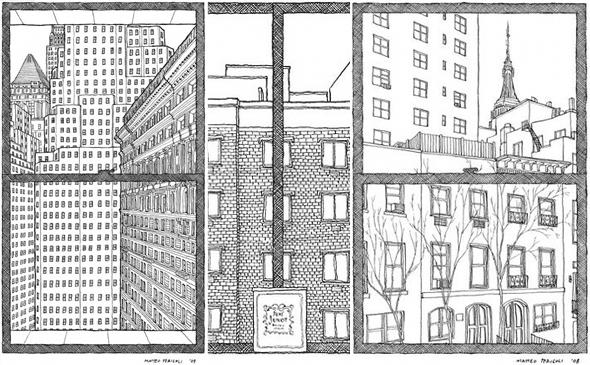 Prague, Paris and Barcelona all featured – as did happy return trips to New York and Toronto. My carbon footprint has been quite heavy this year, apologies to the world on that. There have also been a number of weddings – so further congratulations to Aimi and Gary, Paul and Victoria and Chris and Cecilia on that front. Not to mention the great increase in quality time spent with my family now we’re on the right side of the world again. 2009 was also a great year for gigs – from perennial faves TV on the Radio, Daedelus, PJ Harvey and the amazing Blur reunion gig at Southend. We thought that Blur wouldn’t be beaten, but then a last minute intimate Pearl Jam gig at Shepherd Bush snuck in there to give them a good run for their money, as well as unexpectedly superb Yeah Yeah Yeahs and Pixies gigs. Wow. 2010 has a lot to live up to there. As to the decade. Well you can read this blog if you want, which started in earnest on February 27th, 2000 with this unauspicious first post. Yes, this blog is almost turning ten! It’s seen a lot of good times with friends around the world, and a lot of tragedy with the events of 9/11 and the election of George Wanker Bush amongst others. Although the Internet has revolutionised our world, it hasn’t helped us to overcome the fears and governmental idiocy that have been introduced at the same time – or at least not yet.. Decade highlights for me have to be the arrival of four nieces and nephews, getting to travel round the world and learning to scuba dive, living in New York and Montreal, making some great friends, and spending half that decade with the ever lovely M.
So for everyone, everywhere – here’s to a happy, healthy 2010 and the decade beyond. Go for your dreams and don’t listen to the naysayers. Skol! Since I’m happily on Christmas hols already, combined with last week’s random purchase of a Tate membership, I decided to head down to the Tate Modern today to check out the Rothko and Cildo Meireles exhibitions. Oh, and the apocalyptic future vision currently in the turbine hall. Good fun – but have to say the Rothko didn’t grab me, so no real change there. The Meireles work on the other hand was wonderful. Highly engaging conceptual art that you get to play with and enter – from rolling balls around, to fighting your way through suspended rulers to cracking underfoot glass – my favourite. Well worth a visit, but hurry – it ends January 11th. In other random news – it sounds like David Tennant may be returning to Hamlet in the last week, no guarantees though. Of course this means there will be a flurry of activity waiting for returns, etc if it does happen and I’ll find myself wondering if it’s worth the, usually effective, returns queue wait. Somehow I think returns will be unlikely after all the furore thus far. Still, if he does return to tread the boards we may brave the line. And if that doesn’t work, there’s always Pete Posthlethwaite in King Lear at the Young Vic I guess.